There’s been a lot of hype related to smartwatches lately. With Android Wear being made available by Google, the platform was open for manufacturers to design and develop their devices around the OS. Three manufacturers entered the fray. These were LG, Motorola and Samsung, and all of them demoed their devices at Google’s annual I/O event held this year. The three watches announced were LG’s G Watch, Motorola’s Moto 360 and Samsung’s Gear Live. We did a detailed comparison of their features for you. If you want to take a look at that, click here. Well, it seems like HTC has decided to enter the fray as well. And seriously at that. HTC was rumored previously to have had interest in the smartwatch arena, with the device being called HTC’s One Wear. At that time, the device was rumored to be similar to Motorola’s Moto 360, which by far is the most popular smartwatch currently. Well, today @evleaks puts these rumors to rest; with another rumor of course. The tipster has posted an image which is the first render of the HTC One Wear, according to him. 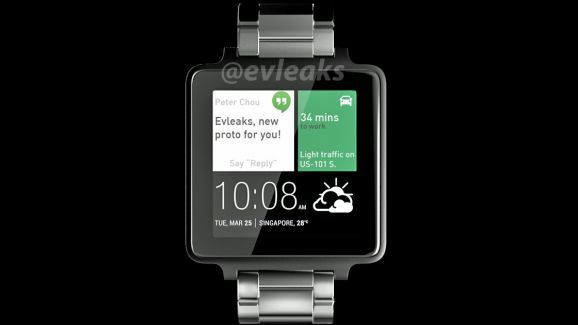 As you can see in the render above, HTC’s alleged smartwatch is not similar to the Moto 360 in anyway at all. Accuracy is guaranteed by @evleaks, who says: “Hardware is 100% faithful reproduction.” However apart from the design, if we look carefully at the screen, it seems like HTC has decided to give the device a version of it’s HTC Sense. Whatever the case may be, it looks like HTC is on its way to enter the smartwatch fray. If that’s the case, then we could be looking at a very exciting device indeed.